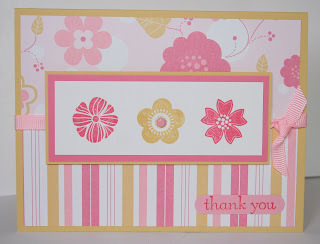 A simple card using an image out of Eastern Blooms. Fun set to work with, by the way! The papers are out of the Georgia Peach pack. Sentiment is out of Bella Blossoms! At first I was very intimidated by this large flower image in the new Bella Blossoms set!! I really like the sketching design of it though and wanted to give it a try. 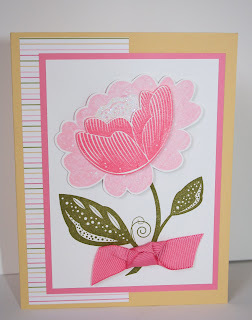 The base image is stamped in olive, then I stamped the flower two more times, regal rose and pink pirouette. The pink ones are cut out and layered with dimensionals. A little dazzling diamonds glitter finishes off the flower center. The stripe paper is from the Georgia Peach pack. Fun paper!